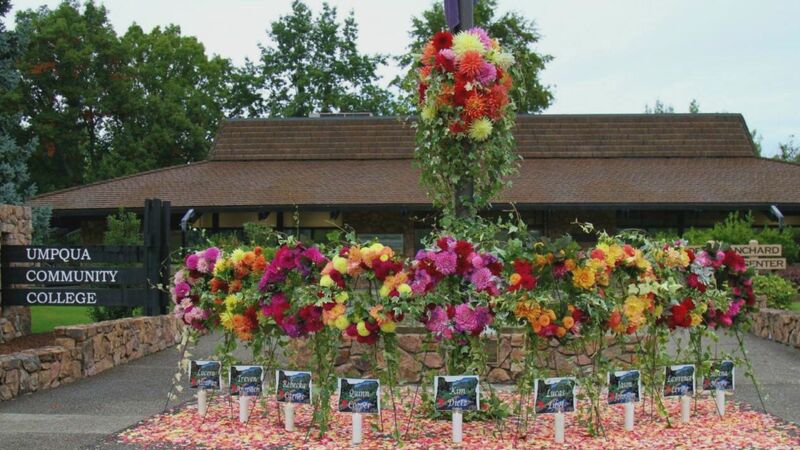 MEDFORD, Ore. — Today, marks three years since a gunman opened fire on the Umpqua Community College campus in Roseburg killing nine people and injuring 8 more. Today, the victims and survivors are being remembered at UCC and beyond. Students, staff, affected family members and law enforcement went to a private ceremony at 10:15. A public memorial is also assembled on campus from sunrise to sunset. UCC’s flag was half-staff along with a floral arrangement displayed around the campus flag pole paying tribute to both victims and survivors. Many gathered around while bagpipers were playing and a moment of silence was observed. UCC plans to hold a day of remembrance every year paying tribute to those lost and those who survived.